Today I played around with my new disc cutter and dapping set. These earrings are the result. I cut discs out of sheet copper using several blows with a hammer (and then wrestled the disc cutter apart). Then I hammered the discs to give them a bit of texture and domed them using the dapping set. I drilled holes with my Dremel and added some freshwater pearls. 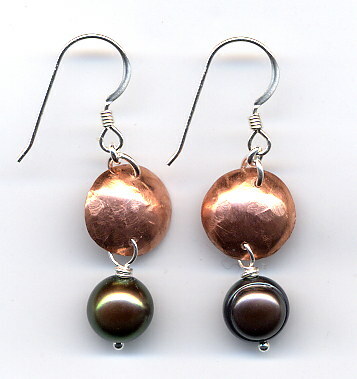 I expect the copper to patina over time, which will give a more subtle look. Can you tell I’m ready for fall? I have been making jewelry since I was 6, either giving it away or selling it to my mom’s friends. 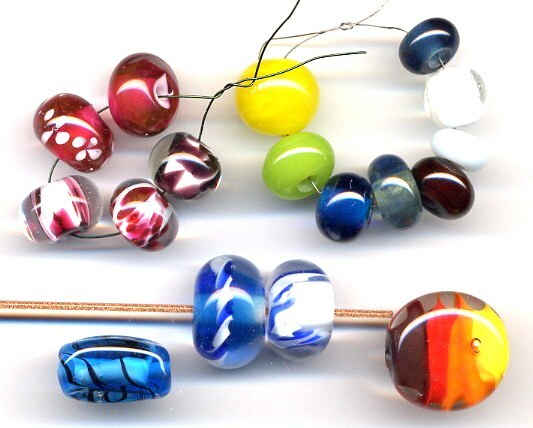 When we moved to Delaware in 2003 I was really into decorating and sewing and gradually getting into beads again (all my supplies fit into a shoebox at that point). A year later I was having lunch with my pal Debora Haughton and wearing a necklace of brown sea glass wrapped in copper wire to show her what I had been working on. She said, “Cute necklace. You should sell that. I’ll have a party for people to come buy jewelry this summer.” I had sold my jewelry to people who asked, but I had never thought about having a trunk show or selling it to stores (like Debora also encouraged me to do). And that is when/why/how I went pro. I didn’t sit around thinking of how to get rich quick or what jobs I could do from home (the thought of commuting in my socks enamored me). God just dropped that one in my lap and I really feel a peace about what I do. Thank you to all those people who have helped AnneMade Jewelry grow in the past 2 years!